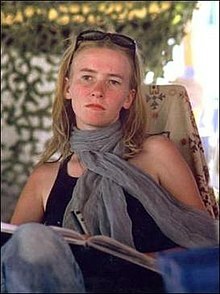 Rachel Aliene Corrie (April 10, 1979 – March 16, 2003) was an American activist and diarist. She was a member of a pro-Palestinian group called the International Solidarity Movement (ISM). She was killed by an Israel Defense Forces (IDF) armored bulldozer in a combat zone in Rafah, in the southern part of the Gaza Strip, under contested circumstances during the height of the second Palestinian intifada. She had gone to Gaza as part of her senior-year college assignment to connect her home town with Rafah in a sister cities project. While there, she had engaged with other International Solidarity Movement (ISM) activists in efforts to prevent the Israeli army's demolition of Palestinian houses. According to the Israeli authorities the demolitions were carried out to eliminate weapons-smuggling tunnels. According to human rights groups the demolitions were used as collective punishment. The Israeli army conducted an investigation, which concluded that the death was an accident, and that the driver of the bulldozer could not see Corrie due to limited visibility from his cab. Amnesty International and Human Rights Watch as well as B'Tselem and Yesh Din criticized the military investigation. In 2005, Corrie's parents filed a civil lawsuit against the state of Israel. The lawsuit charged Israel with not conducting a full and credible investigation into the case and with responsibility for her death, contending that she had either been intentionally killed or that the soldiers had acted with reckless neglect. They sued for a symbolic one US dollar in damages. In August 2012, an Israeli court rejected their suit and upheld the results of the 2003 military investigation, ruling that the Israeli government was not responsible for Corrie's death. The ruling was met with criticism by some human rights organizations such as Amnesty International and Human Rights Watch, and by activists. An appeal against the August 2012 ruling was heard on May 21, 2014. On February 14, 2015, the Supreme Court of Israel rejected the appeal. Corrie was born on April 10, 1979, and raised in Olympia, Washington, United States. She was the youngest of three children of Craig Corrie, an insurance executive, and Cindy Corrie. Cindy describes their family as "average Americans—politically liberal, economically conservative, middle class". After graduating from Capital High School, Corrie went on to attend The Evergreen State College, also in Olympia, where she took a number of arts courses. She took a year off from her studies to work as a volunteer in the Washington State Conservation Corps. According to the ISM, she spent three years making weekly visits to mental patients. While at Evergreen State College she became a "committed peace activist" arranging peace events through a local pro-ISM group called "Olympians for Peace and Solidarity". She later joined the International Solidarity Movement (ISM) organisation in order to challenge the policies of the Israeli army in the West Bank and Gaza Strip. In her senior year, she proposed an independent-study program in which she would travel to Gaza, join protesters from the ISM, and initiate a "sister city" project between Olympia and Rafah. Before leaving, she also organized a pen-pal program between children in Olympia and Rafah. While in Rafah, Corrie stood in front of armored bulldozers, in an alleged attempt to impede house demolitions which the ISM claims were being carried out. Demolitions were a common tactic employed along the security road near the border between Israel and Egypt at Rafah to uncover explosive devices and destroy tunnels used by terrorists to smuggle weapons from Egypt to Gaza. These military operations were criticized as "collective punishment" by some human rights groups. Israel authorities said that demolitions were necessary because "Palestinian gunmen used the structures as cover to shoot at their troops patrolling in the area, or to conceal arms-smuggling tunnels under the Gaza-Egypt border." Corrie was a member of a group of about eight activists from outside of the Palestinian territories who tried to prevent the Israeli army's activities by acting as human shields. On Corrie's first night there, she and two other ISM members set up camp inside Block J, which the ISM described as "a densely populated neighborhood along the Pink Line and frequent target of gunfire from an Israeli watchtower". By situating themselves visibly between the Palestinians and the Israeli snipers manning the watchtowers they hoped to discourage shooting by displaying banners stating that they were "internationals". When Israeli soldiers fired warning shots, Corrie and her colleagues dismantled their tent and left the area. Qishta, a Palestinian who worked as an interpreter, noted: "Late January and February was a very crazy time. There were house demolitions taking place all over the border strip and the activists had no time to do anything else." Qishta also stated of the ISM activists: "They were not only brave; they were crazy." The safety of the protestors was frequently jeopardized by these confrontations— a British participant was wounded by shrapnel while retrieving the body of a Palestinian man killed by a sniper, and an Irish ISM activist had a close encounter with an armored bulldozer. Palestinian militants expressed concern that the "internationals" staying in tents between the Israeli watchtowers and the residential neighborhoods would get caught in crossfire, while other residents were concerned that the activists might be spies. To overcome this suspicion Corrie learned a few words of Arabic and participated in a mock trial denouncing the "crimes of the Bush Administration". While the ISM members were eventually provided with food and housing, a letter was circulated in Rafah that cast suspicion on them. "Who are they? Why are they here? Who asked them to come here?" On the morning of Corrie's death they planned to counteract the letter's effects. According to one of them, "We all had a feeling that our role was too passive. We talked about how to engage the Israeli military." According to a January 2003 article by Gordon Murray, a fellow ISM activist, in the last month of her life Corrie "spent a lot of time at the Canada Well helping protect Rafah municipal workers" who were trying to repair damage to the well done by Israeli bulldozers. Canada Well was built in 1999 with CIDA funding. It, along with El Iskan Well, had supplied more than 50% of Rafah's water before the damage. The city had been under "strict rationing (only a few hours of running water on alternate days)" since. Murray writes that ISM activists were maintaining a presence there since "Israeli snipers and tanks routinely shot at civilian workers trying to repair the wells." In one of her reports, Corrie wrote that despite her group's having received permission from the Israeli District Command Office and the fact that they were carrying "banners and megaphones the activists and workers were fired upon several times over a period of about one hour. One of the bullets came within two metres of three internationals and a municipal water worker close enough to spray bits of debris in their faces as it landed at their feet." 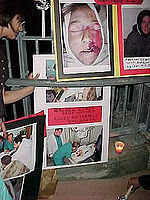 While in Gaza, Corrie took part in a demonstration as part of the February 15, 2003 anti-war protest against the invasion of Iraq. She was photographed burning a makeshift U.S. flag. Robert Spencer criticized Corrie for having burned the flag in front of children, writing that she was "fostering ... hatred" of the United States. In the words of Rachel's parents: "The act, while we may disagree with it, must be put into context. Rachel was partaking in a demonstration in Gaza opposing the War on Iraq. She was working with children who drew two pictures, one of the American flag, and one of the Israeli flag, for burning. Rachel said that she could not bring herself to burn the picture of the Israeli flag with the Star of David on it, but under such circumstances, in protest over a drive towards war and her government's foreign policy that was responsible for much of the devastation that she was witness to in Gaza, she felt it OK to burn the picture of her own flag. We have seen photographs of memorials held in Gaza after Rachel's death in which Palestinian children and adults honor our daughter by carrying a mock coffin draped with the American flag. We have been told that our flag has never been treated so respectfully in Gaza in recent years. We believe Rachel brought a different face of the United States to the Palestinian people, a face of compassion. It is this image of Rachel with the American flag that we hope will be remembered most. Rachel Corrie sent a series of emails to her mother while she was in Gaza, four of which were later published by The Guardian. In January 2008, Norton published a book titled Let Me Stand Alone by Corrie, which included the e-mails along with some of her other writings. Yale Professor David Bromwich said that Corrie left "letters of great interest". The play My Name is Rachel Corrie and the cantata The Skies are Weeping were based on Corrie's letters. On March 16, 2003, the IDF was engaged in an operation, possibly involving the demolition of Palestinian houses, to seize weapons and locate smuggling tunnels in a military zone between the Rafah refugee camp and the Egyptian border called Philadelphi Route. Corrie was part of a group of three British and four American ISM activists attempting to disrupt the IDF operation. Corrie placed herself in the path of a Caterpillar D9R armored bulldozer in the area and was run over by the bulldozer and fatally injured. After she was injured she was taken by a Red Crescent ambulance to the Palestinian Najar hospital, arriving at the emergency room at 5:05 pm, still alive but near death. At 5:20 pm she was declared dead. The events surrounding Corrie's death are disputed. Fellow ISM activists said that the soldier operating the bulldozer deliberately ran Corrie over while she was acting as a human shield to prevent the demolition of the home of local pharmacist Samir Nasrallah. They said she was between the bulldozer and a wall near Nasrallah's home, in which ISM activists had spent the night several times. Israeli eyewitnesses maintain that the death was accidental because the bulldozer operator was unable to see Corrie due to the vehicle's obstructed view. Furthermore, Israeli witnesses maintain that Corrie was not defending a house from being demolished and was instead inhibiting a military operation to find contraband weapons and smuggling tunnels in Gaza. An IDF officer testified in court that on that day they were only clearing vegetation and rubble from houses that were previously demolished, and that no new houses were slated for demolition. The major points of dispute are whether the bulldozer operator saw Corrie and whether her injuries were caused by being crushed under the blade or by the mound of debris the bulldozer was pushing. An IDF spokesman has acknowledged that Israeli army regulations normally require that the operators of the armored personnel carriers (APCs) that accompany bulldozers are responsible for directing the operators towards their targets because the Caterpillar D9 bulldozers have a restricted field of vision with several blind spots. ISM activist Richard Purssell testified, "[t]hey began demolishing one house. We gathered around and called out to them and went into the house, so they backed out. During the entire time they knew who we were and what we were doing, because they didn't shoot at us. We stood in their way and shouted. There were about eight of us in an area about 70 square meters. Suddenly, we saw they turned to a house they had started to demolish before, and I saw Rachel standing in the way of the front bulldozer." Human-rights activists and Palestinians say that the demolitions had also been accompanied by gunfire from Israeli snipers. The director of Rafah's hospital, Dr. Ali Moussa said that 240 Palestinians, including 78 children, had been killed since the Al-Aqsa Intifada began in 2001, "Every night there is shooting at houses in which children are sleeping, without any attacks from Palestinians." The United Nations said that 582 Rafah homes were demolished and 721 damaged, with 5,305 people made homeless. There's no way he didn't see her, since she was practically looking into the cabin. At one stage, he turned around toward the building. The bulldozer kept moving, and she slipped and fell off the plow. But the bulldozer kept moving, the shovel above her. I guess it was about 10 or 15 meters that it dragged her and for some reason didn't stop. We shouted like crazy to the operator through loudspeakers that he should stop, but he just kept going and didn't lift the shovel. Then it stopped and backed up. We ran to Rachel. She was still breathing. Eyewitness and ISM member Tom Dale, commenting on the 2012 verdict said: "Whatever one thinks about the visibility from a D9 bulldozer, it is inconceivable that at some point the driver did not see her, given the distance from which he approached, while she stood, unmoving, in front of it. As I told the court, just before she was crushed, Rachel briefly stood on top of the rolling mound of earth which had gathered in front of the bulldozer: her head was above the level of the blade, and just a few meters from the driver." Still wearing her fluorescent jacket, she knelt down at least 15 meters in front of the bulldozer, and began waving her arms and shouting, just as activists had successfully done dozens of times that day.... When it got so close that it was moving the earth beneath her, she climbed onto the pile of rubble being pushed by the bulldozer.... Her head and upper torso were above the bulldozer's blade, and the bulldozer operator and co-operator could clearly see her. Despite this, the operator continued forward, which caused her to fall back, out of view of the driver. [sic] He continued forward, and she tried to scoot back, but was quickly pulled underneath the bulldozer. We ran towards him, and waved our arms and shouted; one activist with the megaphone. But the bulldozer operator continued forward, until Corrie was all the way underneath the central section of the bulldozer. On March 18, 2003, two days after Corrie's death, Joe (Smith) Carr was interviewed by British Channel 4 and The Observer reporter Sandra Jordan for a documentary, The Killing Zone, which aired in June 2003. He stated, "It was either a really gross mistake or a really brutal murder." According to The Seattle Times, "Smith, who witnessed Sunday's incident, said it began when Corrie sat down in front of the bulldozer. He said the operator scooped her up with a pile of earth, dumped her on the ground and ran over her twice." However, "Smith" later acknowledged that after Corrie fell down the dirt pile, the bulldozer operator could well have lost sight of Corrie. You can't hear, you can't see well. You can go over something and you'll never know. I scooped up some earth, I couldn't see anything. I pushed the earth, and I didn't see her at all. Maybe she was hiding in there. The IDF produced a video about Corrie's death that includes footage taken from inside the cockpit of a D9. The video makes a "credible case", wrote Joshua Hammer in Mother Jones, that "the operators, peering out through narrow, double-glazed, bulletproof windows, their view obscured behind pistons and the giant scooper, might not have seen Corrie kneeling in front of them". In April 2011, during the trial of the civil suit brought by Corrie's parents, an IDF officer testified that Corrie and other activists had spent hours trying to block the bulldozers under his command. He went on to say that it was a war zone "where Palestinian militants used abandoned homes as firing positions and exploited foreign activists for cover". He shouted over a megaphone for the activists to leave, tried to use tear gas to disperse them and moved his troops several times. "To my regret, after the eighth time, (Corrie) hid behind an earth embankment. The D9 operator didn't see her. She thought he saw her," he said. An infantry major later testified that the activists were endangering troops and had ignored numerous warnings to leave the area. Between September 2000 and the date of Corrie's death Israeli forces in the area had been subjected to 1,400 attacks involving gunfire, 150 involving explosive devices, 200 involving anti-tank rockets, and 6,000 involving hand grenades or mortar fire. Prime Minister of Israel Ariel Sharon promised President Bush a "thorough, credible, and transparent investigation". Later, Capt. Jacob Dallal, a spokesman for the Israeli army, called Corrie's death a "regrettable accident" and said that she and the other ISM activists were "a group of protesters who were acting very irresponsibly, putting everyone in danger—the Palestinians, themselves and our forces—by intentionally placing themselves in a combat zone". An autopsy was conducted on March 24 at the Abu Kabir Forensic Institute in Tel Aviv by Chief Pathologist Yehuda Hiss. The final report was not released publicly, but in their report on the matter Human Rights Watch says a copy was provided to them by Craig Corrie, with a translation supplied by the U.S. Department of State. In the report they quote Hiss as concluding, "Her death was caused by pressure on the chest (mechanical asphyxiation) with fractures of the ribs and vertebrae of the dorsal spinal column and scapulas, and tear wounds in the right lung with hemorrhaging of the pleural cavities." —  The Guardian, April 14, 2003. The classified IDF report made no mention of the pathologist's conclusion. [a bulldozer with 2 crews] was engaged in "routine terrain leveling and debris clearing", not building demolition. Quoting from the IDF report, Corrie died "as a result of injuries sustained when earth and debris accidentally fell on her.... Ms. Corrie was not run over by the bulldozer," he added, IDF also claimed she was possibly "in a blindspot for the bulldozer operators and "behind an earth mound", so they did not see that she was in harm's way. In later IDF operations, the house was damaged (a hole was knocked in a wall) and was later destroyed. By that time, the Nasrallah family had moved into a different house. It was reported in 2006 that the house that Corrie was trying to protect was rebuilt with funds raised by The Rebuilding Alliance. The IDF gave copies of the report, titled "The Death of Rachel Corrie", to members of the U.S. Congress in April 2003, and Corrie's family released the document to the media in June 2003, according to the Gannett News Service. In March 2004 the family said that the entire report had not been released, and that only they and two American staffers at the U.S. Embassy in Tel Aviv had been allowed to view it. The family said they were allowed to look at the report in the Consulate General of Israel to the Pacific Northwest in San Francisco. The ISM rejected the Israeli report, stating that it contradicted their members' eyewitness reports and that the investigation had not been credible and transparent. Corrie's father, Craig Corrie has said "I know there's stuff you can't see out of the double glass windows." But he has denied that as a valid excuse, saying "you're responsible for knowing what's in front of your blade... It's a no brainer that this was gross negligence". He added that "they had three months to figure out how to deal with the activists that were there." In March 2003, U.S. Representative Brian Baird introduced a resolution in the U.S. Congress calling on the U.S. government to "undertake a full, fair, and expeditious investigation" into Corrie's death. The House of Representatives took no action on the resolution. The Corrie family joined Representative Baird in calling for a U.S. investigation. Yasser Arafat, the first President of the Palestinian Authority, offered his condolences and gave the "blessings of the Palestinian people" to Corrie, promising to name a street in Gaza after her. According to Cindy Corrie, Arafat told Craig Corrie that Rachel Corrie "is your daughter but she is also the daughter of all Palestinians. She is ours too now." On March 21, 2003, the U.S. Green Party called for an investigation of the "murder of American Peace Activist Rachel Corrie by Israeli Forces". In August 2012, U.S. Ambassador to Israel Dan Shapiro stated that the Israeli investigation was not satisfactory, and was not as thorough, credible or transparent as it should have been. Shapiro said further that the government of the United States is unsatisfied with the IDF's closure of its official investigation into Corrie's death. Amnesty International called for an independent inquiry, with Christine Bustany, their advocacy director for the Middle East, saying, "U.S.-made bulldozers have been 'weaponized' and their transfer to Israel must be suspended." In 2005, Human Rights Watch published a report raising questions about the impartiality and professionalism of the IDF investigation. Some of the problems that the report mentioned were the investigators' lack of preparation, the "hostile," "inappropriate," and "mostly accusatory" questions they asked witnesses, the failure to ask witnesses to draw maps or to identify locations of events on maps, and their lack of interest in reconciling soldiers' testimonies with those of other eyewitnesses. NGO Monitor, an Israeli group, strongly criticized other NGOs and said the verdict reflects all of the facts and circumstances surrounding the incident. Its president, Gerald Steinberg said, "Corrie's death was entirely unnecessary, and the leaders of the ISM bear much culpability for her death." Shurat HaDin, an organization representing Israeli victims of terrorism, said that the Corrie Family should sue the Palestinian Authority and ISM over their daughter's death. The Observer suggested that because Corrie was American her death attracted more attention than the deaths of Palestinians under similar circumstances: "On the night of Corrie's death, nine Palestinians were killed in the Gaza Strip, among them a four-year-old girl and a man aged 90. A total of 220 people have died in Rafah since the beginning of the intifada. Palestinians know the death of one American receives more attention than the killing of hundreds of Muslims." Of all of the tragedies and casualties of the intifada, in which more than 4,000 people were killed over five years, the case of Rachel Corrie still stands apart, the subject of intense world interest and fierce debate.... Part of it starts with us. "They had no business being there" is no excuse for what the Pentagon long ago christened collateral damage. We've learned much. But we're still not there. 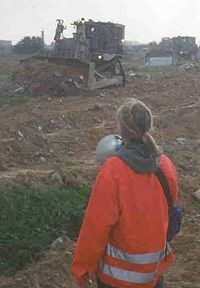 We should have saved Rachel Corrie's life that day, either by sending out a spotter or delaying the bulldozer's work. Right now, somewhere in the West Bank, there's an eight-year-old whose life could be saved next week, if we've managed to learn the lesson and are resourceful enough to know how to apply it. American journalist Charlie Wolf referred to Corrie as "scum" on his show on British radio station talkSPORT. Media regulator Ofcom ruled that this "seriously ill-judged" remark was in breach of the "Generally Accepted Standards" of Broadcasting. Tom Gross, in an article called "The Forgotten Rachels", discusses six other women named Rachel who were Jewish victims of Palestinian terrorism in the Arab-Israeli conflict. Their deaths, he wrote, received little if any coverage outside Israel. Gross went on to argue that "partly because of the efforts of Corrie's fellow activists in the ISM, the Israeli army was unable to stop the flow of weapons through the tunnels.... Those weapons were later used to kill Israeli children ... in southern Israel". The article prompted a National Review editorial arguing "Corrie's death was unfortunate, but more unfortunate is a Western media and cultural establishment that lionizes 'martyrs' for illiberal causes while ignoring the victims those causes create." Explaining the Israeli court's ruling, judge Oded Gershon said Corrie's death was "the result of an accident she brought upon herself." Corrie was in a closed military area, with entry forbidden to civilians. The area was the site of daily gunfire by snipers, missile fire and IED explosions. The United States government had issued a travel warning against American citizens visiting the Gaza Strip. "She did not distance herself from the area, as any thinking person would have done," the judge ruled. George Rishmawi, director of the Palestinian Center for Rapprochement between Peoples, told the San Francisco Chronicle that the ISM's main purpose is to "increase international awareness of Palestinian suffering through the involvement of foreign activists". He stated: "When Palestinians get shot by Israeli soldiers, no one is interested anymore ... [b]ut if some of these foreign volunteers get shot or even killed, then the international media will sit up and take notice." Joseph Smith (aka Joseph Carr) stated that "'We knew there was a risk ... but we also knew it never happened in the two years that we (the ISM) have been working here. I knew we take lots of precautions so that it doesn't happen, that if it did happen it would have to be an intentional act by a soldier, in which case it would bring a lot of publicity and significance to the cause.'" Since their daughter's death, Corrie's parents, Cindy and Craig, have spent time trying to "promote peace and raise awareness about the plight of Palestinians", and continue what they believe to be her work. The Corries have worked to set up the "Rachel Corrie Foundation for Peace and Justice" and launched projects in memory of their daughter. They have also advanced investigation into the incident and asked the U.S. Congress and various courts for redress. Corrie's parents have visited the region several times since their daughter's death and have twice visited Gaza. Following their daughter's death, they visited Gaza and Israel, seeing the place where she died, and meeting ISM members and Palestinians whom she had known. They also visited Ramallah in the West Bank, where Arafat met them and presented them with a plaque in memory of their daughter. On March 28, 2008, they addressed a demonstration in Ramallah at which Craig Corrie said: "This village has become a symbol of nonviolent resistance. I call for solidarity with the people of Palestine in resisting the conditions imposed by the Israeli occupation to prevent the establishment of their state." The Nasrallahs, whose home Rachel Corrie allegedly believed she was preventing from destruction, toured with the Corries across the United States in June 2005. The aim of the trip was, with the cooperation of the Rebuilding Alliance, to raise funds to rebuild the Nasrallah home and other homes destroyed in Rafah. In January 2011, Corrie's parents visited the MV Mavi Marmara in Turkey, together with the head of the IHH Bülent Yıldırım. Cindy Corrie called dead Mavi Marmara activists "martyrs" and compared them to her daughter. Corrie's family and several Palestinians filed a federal lawsuit against Caterpillar Inc. in the United States District Court for the Western District of Washington alleging liability for Corrie's death. The suit alleged Caterpillar supplied the bulldozers to the Israelis despite having notice they would be used to further "a policy plaintiffs contend violates international law". The case was dismissed by a Federal judge in November 2005 for lack of subject matter jurisdiction, citing, among other things, the political question doctrine. The judge found, alternatively, that the plaintiffs' claims failed on the merits. The Corrie family appealed to the United States Court of Appeals for the Ninth Circuit. In September 2007 the Ninth Circuit affirmed the dismissal on the political question grounds and thus did not rule on the merits of the suit. The Court found that as the bulldozers were paid for by the U.S. Government as part of its aid to Israel, the Judicial Branch could not rule on the merits of the case without ruling on whether or not the government's financing of such bulldozers was appropriate and that this was a matter not entrusted to the Judicial Branch. In 2010, Corrie's parents, represented by Attorney Hussein Abu Hussein, filed a lawsuit against the Israel Defense Forces and the Israeli Defense Ministry in the Haifa District Court, seeking US$324,000 in compensation. The case began in Haifa on March 10, 2010. Judge Oded Gershon presided over the case. On October 21, 2010, the bulldozer driver who had run over Corrie testified for four hours, and was cross-examined by the Corries' attorney. At the request of state prosecutors, who argued that his life could be imperiled if he was publicly identified, the driver was hidden behind a screen and visible to only the judge and attorneys. A request by the Corrie family that they also be allowed to see the driver was turned down by the judge. The driver was identified only by his initials, "YB", and a gag order was imposed on identifying details, although it was disclosed in court that he was a 38-year old Russian immigrant who had arrived in Israel at age 23, and was working for a food processing company at the time. The driver denied having seen her before hitting her. In addition, four experts, including an expert on the behalf of the Corrie family testified during the trial, and concluded that the bulldozer driver could not see Corrie. Four ISM witnesses testified during the case. However, the Palestinian physician from Gaza who had examined Corrie's wounds on the scene was unable to testify after Israel refused him an entry visa and rejected an application for him to testify by video link. The court ruled against Corrie's family on August 28, 2012. In a 62-page verdict, Judge Oded Gershon ruled that Corrie's death was an accident for which she was responsible, and absolved the IDF of any wrongdoing. The judge ruled that the bulldozer driver and his commander had a very limited field of vision and could not possibly have seen her. According to the judge "The mission of the IDF force on the day of the incident was solely to clear the ground.... The mission did not include, in any way, the demolition of homes." The court invoked the principle of the combatant activities exception, as the IDF was attacked in the same area where Corrie was killed a few hours earlier; that Corrie could have avoided the danger and that defendants were not at fault as there was neither intent nor negligence involved in her death. The judge said that the IDF did not violate Corrie's right to life because Corrie had placed herself in a dangerous situation, that Israel's investigation was appropriate and did not contain mistakes, and also criticized the U.S. government for failing to send a diplomatic representative to observe Corrie's autopsy. Gershon said: "I rule unequivocally that the claim that the deceased was intentionally hit by the bulldozer is totally baseless. This was an extremely unfortunate accident. I reached the conclusion that there was no negligence on the part of the bulldozer driver. I reject the suit. There is no justification to demand the state pay any damages. She [Corrie] did not distance herself from the area, as any thinking person would have done. She consciously put herself in harm's way." Furthermore, Gershon pointed to three different entry bans, and also pointed out that the Philadelphi route was effectively a war zone and was formally declared a closed military zone when Corrie died. Gershon also noted that the United States had issued an Israel travel advisory warning to avoid Gaza and the West Bank. In addition, Gershon said that the ISM "abuses the human rights discourse to blur its actions which are de facto violence" and specialized in disrupting IDF activity, which "included an army of activists serving as 'human shields' for terrorists wanted by Israeli security forces, financial and logistical aid to Palestinians including terrorists and their families, and disruption of the sealing of suicide bombers' houses". The Corrie family lawyer, Hussein Abu Hussein, said they were "now studying our options", in regards to a possible appeal. Haifa District Court spokeswoman Nitzan Eyal said that her family could appeal the ruling. The amount sought was a symbolic US$1 and legal costs. Her mother reacted to the verdict in saying: "I am hurt. We are, of course, deeply saddened and deeply troubled by what we heard today from Judge Oded Gershon." Corrie's sister, Sarah Corrie Simpson, stated that she believed "without a doubt" that the driver had seen her as he approached, and stated that she hoped he would one day "have the courage" to tell the truth. The right wing political party Yisrael Beitenu issued a statement that called the verdict "vindication after vilification". Former UN Special Rapporteur on the occupied Palestinian Territories Richard Falk said of the verdict that it was "a sad outcome, above all for the Corrie family that had initiated the case back in 2005, but also for the rule of law and the hope that an Israeli court would place limits on the violence of the state, particularly in relation to innocents and unarmed civilians in an occupied territory". Former U.S. President Jimmy Carter of the Carter Center said that the "court's decision confirms a climate of impunity, which facilitates Israeli human rights violations against Palestinian civilians in the Occupied Territory". The verdict of the Haifa District Court was appealed to the Supreme Court of Israel on May 21, 2014. The Supreme Court rejected the appeal and upheld the District Court's verdict regarding the circumstances of Corrie's death, which cleared the IDF from wrongdoing. Immediately after her death, posters and graffiti praising Corrie were posted in Rafah, with one graffiti tag reading, "Rachel was an American citizen with Palestinian blood." According to the ISM's official publications, the day after Corrie died, about thirty American and European ISM activists with 300 Palestinians began protests during the public memorial service over the spot where she was fatally injured in Rafah. Gordon Murray, an ISM activist who attended the memorial, states that the IDF sent a representative to the event who intimidated the mourners into dispersing, allegedly using non-lethal weapons. In 2008, Corrie's parents commemorated the fifth anniversary of her death at an event held in the West Bank town of Nablus. About 150 Palestinians and foreigners joined them to dedicate a memorial to Corrie on one of the city's streets. In 2011, Iran named a street in Tehran after Corrie. In 2004, Alaska composer Philip Munger wrote a cantata about Corrie called The Skies are Weeping, which was scheduled to premiere on April 27 at the University of Alaska Anchorage, where Munger teaches. After objections to the upcoming performance were received, including from members of the Jewish community, a forum was held co-chaired by Munger and a local rabbi who claimed the work "romanticized terrorism". After the forum "disintegrate[d]", Munger announced, "I cannot subject 16 students ... to any possibility of physical harm or to the type of character assassination some of us are already undergoing. Performance of The Skies are Weeping at this time and place is withdrawn for the safety of the student performers." Munger later related that he had received threatening e-mails whose content he considered was "[just] short of what you'd take to the troopers", and that some of his students had received similar communications. The cantata was eventually performed at the Hackney Empire theatre in London, premiering on November 1, 2005. In early 2005, My Name is Rachel Corrie, a play composed from Corrie's journals and emails from Gaza and compiled by actor Alan Rickman and journalist Katharine Viner, in a production directed by Rickman, was presented in London and later revived in October 2005. The play was to be transferred to the New York Theatre Workshop, but when it was postponed indefinitely, the British producers denounced the decision as censorship and withdrew the show. It finally opened Off-Broadway on October 15, 2006, for an initial run of 48 performances. In the same year, My Name is Rachel Corrie was shown at the Pleasance theatre as part of the Edinburgh (Fringe) Festival. The play has also been published as a paperback, and performed in ten countries, including Israel. Singer Billy Bragg recounted Corrie's death in the song "The Lonesome Death of Rachel Corrie", composed to the tune of Bob Dylan's "The Lonesome Death of Hattie Carroll". After being originally released as a free digital download, it was included on the album Fight Songs in 2011. Irish folk music/world music group Kíla included the instrumental "Rachel Corrie" on their 2015 album Suas Síos. In 2003, British Channel 4 and The Observer reporter Sandra Jordan and producer Rodrigo Vasquez made a documentary that was aired June 2003 on Channel 4 titled The Killing Zone, about ongoing violence in the Gaza Strip. Jordan said: "There has been a lot of interest in Britain and around the world about what happened to Rachel, I find it highly disappointing that no serious American investigative journalist has taken Rachel's story seriously or questioned or challenged the Israeli Army version of events." In 2005, the BBC produced a 60 minute documentary titled When Killing is Easy aka Shooting the Messenger, Why are foreigners suddenly under fire in Israel?, described as "a meticulous examination of" the shooting to death of James Miller, who was shot while filming in an Israeli war zone in May 2003; the shooting of British photography student Thomas Hurndall in April 2003, and the death of Rachel Corrie in March 2003. The documentary claims that the attacks were not "random acts of violence", but rather "represent a culture of killing with impunity which is sanctioned by the higher echelons of the Israeli army." In 2005 Yahya Barakat, who lectures on TV production, cinematography, and filmmaking at al-Quds University, filmed a documentary in Arabic with English subtitles, named Rachel Corrie – An American Conscience. In 2009, a documentary film titled Rachel is produced by Morocco born, French-Israeli director Simone Bitton detailing the death of Rachel Corrie from "an Israeli point of view". Its first North American public screening was at the 2009 Tribeca Film Festival. 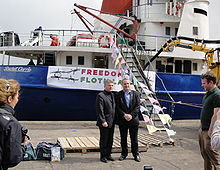 On March 30, 2010, an 1800-tonne vessel was bought at auction in Dundalk, Ireland, for €70,000 by the Free Gaza Movement. It was outfitted for use in a voyage to Gaza, named in honour of Rachel Corrie and launched May 12, 2010. It sailed to join a flotilla intended to break the blockade of the Gaza Strip. The flotilla was intercepted; however, the MV Rachel Corrie had not reached the other ships and continued towards Gaza by itself. Israeli navy officers addressed the ship as "Linda"—the vessel's name before it was renamed for Rachel Corrie. The ship was intercepted by the Israeli navy on Saturday, June 5, 2010, 23 miles off the coast, and diverted to the port of Ashdod. There the cargo was to be inspected and sent over land to Gaza. On the twelfth anniversary of Corrie's death, a symbolic gravestone with her name was installed in the Tehran cemetery to honor her by the Commemoration of Martyrs of movement of the Islamic World's Staff. Near her symbolic gravestone are twelve other symbolic gravestones. ^ a b c "American peace activist killed by army bulldozer in Rafah". Haaretz. March 17, 2003. Retrieved May 8, 2008. ^ a b c d e f g h "Profile: Rachel Corrie". BBC News. August 28, 2012. Retrieved September 13, 2012. ^ Sherwood, Harriet (August 28, 2012). "Rachel Corrie's death was an accident, Israeli judge rules". The Guardian. Retrieved September 8, 2012. ^ a b c d e f g "Court dismisses damages claim in Rachel Corrie case". The Times of Israel. August 28, 2012. Retrieved September 16, 2012. ^ "Rachel Corrie: a memory that refuses to die". The Guardian. August 28, 2012. Retrieved September 7, 2012. ^ a b Gordon, Neve (September 5, 2012). "No justice for Rachel Corrie". Opinion. Al Jazeera. Retrieved September 13, 2012. ^ Abu Hussein, Hussein (September 2, 2012). "Rachel Corrie: Blaming the victim". Opinion. Haaretz. Retrieved July 11, 2014. ^ "Rachel Corrie verdict highlights impunity for Israeli military". Amnesty USA. August 28, 2012. Retrieved July 11, 2014. ^ a b "Israeli bulldozer kills American protester". CNN. March 25, 2003. Retrieved September 8, 2012. ^ a b Urquhart, Conal (April 14, 2003). "Israeli report clears troops over US death". The Guardian. Retrieved April 12, 2010. ^ Webley, Kayla (June 4, 2010). "Who Is Rachel Corrie?". Time. Retrieved June 6, 2010. ^ "Rachel Corrie: A worldwide symbol of the Palestinian struggle". arabnews.com. March 16, 2011. Retrieved September 8, 2012. ^ Tarnopolsky, Noga (September 1, 2012). "Rachel Corrie's death: 'it's a no brainer that this was gross negligence'". Alaska Dispatch. Retrieved September 8, 2012. ^ a b c "Rachel Corrie verdict highlights impunity for Israeli military". Amnesty International. August 29, 2012. Archived from the original on September 2, 2012. Retrieved September 6, 2012. ^ a b Lynfield, Ben (August 2012). "Israeli court dismisses Corrie family's lawsuit, ending effort to put army on trial (+video)". Christian Science Monitor. Retrieved 26 October 2015. ^ a b c Hass, Amira (August 23, 2012). "U.S.: Israeli probe into Rachel Corrie's death wasn't 'credible'". Haaretz. Retrieved September 5, 2012. ^ Pollard, Ruth (August 28, 2012). "Israeli army cleared of activist's death". The Sydney Morning Herald. Retrieved September 7, 2012. ^ a b Beaumont, Peter (February 13, 2015). "Rachel Corrie's family loses wrongful death appeal in Israel's supreme court". The Guardian. Archived from the original on February 15, 2015. ^ Banks, Gabrielle (December 2, 2005). "Parents speaking out to keep alive memory of child killed in Gaza". Pittsburgh Post-Gazette. Archived from the original on February 4, 2006. Retrieved May 12, 2012. ^ Tizon, Tomas Alex; Marshall, Lynn (March 18, 2003). "Activist Had Soft Spot for Underdogs". The Los Angeles Times. Retrieved December 12, 2008. ^ a b Twair, Pat; Twair, Samir (2003). "Hundreds Salute International Solidarity Movement, Rachel Corrie's Parents". Washington Report on Middle East Affairs (July/August). pp. 62–64. ISSN 8755-4917. ^ a b c d e f g h i j k l m n o p q Hammer, Joshua (September–October 2003). "The Death of Rachel Corrie". Mother Jones. Archived from the original on October 1, 2017. ^ Klein (article of May 22, 2003), as republished in Flanders, 2004, p. 182. ^ Myre, Greg (March 17, 2003). "Israeli Army Bulldozer Kills American Protesting in Gaza". The New York Times. Retrieved September 8, 2012. ^ a b Sherwood, Harriet (August 28, 2012). "Rachel Corrie lawsuit result 'dangerous precedent' say human rights groups". The Guardian. ^ Corrie, Rachel (February 28, 2003). "Overview of events in Gaza since Feb 14th". Palestinian Centre for Human Rights. Retrieved September 8, 2012. ^ "'Rachel Corrie' play opens in London after NYC cancellation". CBC News. March 31, 2006. Archived from the original on June 20, 2008. Retrieved September 8, 2012. See photo of burning of mock flag attached to article. ^ Spencer, Robert (2003). Onward Muslim Soldiers: How Jihad Still Threatens America and the West. Regnery Publishing. p. 285. ISBN 978-0-89526-100-7. 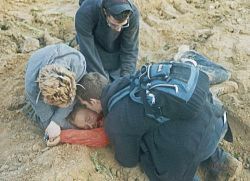 ^ "ISM Statement on the Killing of Rachel Corrie and its Aftermath" (Press release). Rachel Corrie Memorial Website. March 21, 2003. Retrieved September 9, 2012. ^ "Rachel's War". The Guardian. March 17, 2003. Retrieved May 8, 2008. ^ Corrie, Rachel; Rickman, Alan; Viner, Katharine (2005). My Name is Rachel Corrie: The Writings of Rachel Corrie. Nick Hern Books. ISBN 9781854599063. Retrieved September 8, 2012. ^ "Rachel Corrie: 'I am hungry for one good thing I can do'". Seattlepi.com. March 13, 2008. Retrieved July 28, 2010. ^ Bromwich, David (March 16, 2009). "Thoughts on the Death of Rachel Corrie". The Huffington Post. Retrieved September 8, 2012. ^ "Rachel Corrie death: struggle for justice culminates in Israeli court". The Guardian. August 27, 2012. Retrieved August 31, 2012. ^ "Israel calls Corrie death 'accident'". BBC News. June 27, 2003. Retrieved September 8, 2012. ^ a b "IDF officer: U.S. activist ignored warnings before crushed by bulldozer". Haaretz. Associated Press. April 3, 2011. Retrieved September 8, 2012. ^ a b c d Jordan, Sandra (March 22, 2003). "Making of a martyr". The Observer. Retrieved May 8, 2008. ^ a b c "Activists: Death was no accident; Arafat offers condolences". The Seattle Times. Associated Press. March 17, 2003. Retrieved September 8, 2012. ^ Mackey, Robert (August 28, 2012). "Witness to Rachel Corrie's Death Responds to Israeli Court Ruling Absolving Soldier". The New York Times. Retrieved September 7, 2012. ^ Sourani, Raji (June 30, 2003). "Impunity for US Peace Activist's Death". Palestinian Centre for Human Rights (PCHR). Archived from the original on September 4, 2012. Retrieved September 3, 2012. ^ Eamonn Matthews (executive producer), Rodrigo Vazquez (director and cinematographer) (2003). Dispatches: The Killing Zone. Mentorn Midlands. Retrieved September 9, 2012. Joe (Smith) Carr's remarks occur at 9:50 into the documentary. ^ a b "Promoting Impunity: The Israeli Military's Failure to Investigate Wrongdoing". Human Rights Watch. June 22, 2005. Archived from the original on October 7, 2012. Retrieved September 8, 2012. ^ Greg Barrett. Autopsy, military investigation differ on how activist died. Gannett News Service. June 11, 2003. ^ a b c Blume, Howard (June 23, 2005). "Two Families' Dreams Were Not Demolished". Jewish Journal. Retrieved September 8, 2012. ^ Corrie, Cindy (March 18, 2004). "Seeking answers from Israel". Editorial. The Boston Globe. ^ a b Bollyn, Christopher (November 27, 2003). "BBC documentary proves Israeli army murdered Rachel Corrie". Real News 24/7. Archived from the original on December 24, 2003. ^ Sweeney, John (October 30, 2003). "Israel's Silenced Witnesses: Has the Truth Yet Been Told?". The Independent. London. Archived from the original on November 1, 2003. Retrieved May 12, 2012 – via Commondreams.org. ^ Tarnopolsky, Noga (September 1, 2012). "'Gross negligence' killed Rachel Corrie, father says". GlobalPost. Retrieved September 1, 2012. ^ "Bill Summary & Status – 108th Congress (2003–2004) – H.CON.RES.111 – All Congressional Actions". Library of Congress. Retrieved September 8, 2012. ^ Corrie, Cynthia (March 18, 2004). "Seeking Answers from Israel". Boston Globe. Archived from the original on July 24, 2013. Retrieved July 11, 2014. ^ France, Louise (February 29, 2008). "She was a girl from small-town America with dreams of being a poet or a dancer. So how, at just 23, did Rachel Corrie become a Palestinian martyr?". The Guardian. London. Retrieved April 12, 2010. ^ "Greens Call for an Investigation of the Murder of American Peace Activist Rachel Corrie by Israeli Forces" (Press release). U.S. Green Party. March 21, 2003. Archived from the original on September 19, 2012. Retrieved September 10, 2012. ^ "Amnesty International Condemns Killing of Rachel Corrie" (Press release). Amnesty International USA. March 17, 2003. Archived from the original on November 24, 2004. ^ Bikyamasr (August 30, 2012). "UN: Israel Corrie verdict 'defeat for justice'". Ya Libnan. Archived from the original on March 4, 2016. Retrieved September 9, 2012. ^ "NGO Statements on the Rachel Corrie Verdict". NGO Monitor. September 10, 2012. Retrieved July 5, 2014. ^ Jeremy Bob, Yonah (August 28, 2012). "Corrie Family: Ruling a black day for human rights". jpost.com. Retrieved September 8, 2012. ^ "Shurat HaDin calls on Corrie Family to sue Palestinian Authority and ISM over daughter's death" (Press release). Shurat HaDin. August 29, 2012. Retrieved July 5, 2014. ^ Burston, Bradley (March 17, 2006). "Who remembers Rachel Corrie?". Haaretz. Archived from the original on April 23, 2007. Retrieved May 12, 2012. ^ "Ofcom broadcast bulletin Issue number 52" (PDF). Offcom. 23 January 2006. p. 4. Retrieved 26 January 2015. ^ a b Gross, Tom (October 22, 2005). "The Forgotten Rachels". The Spectator. Archived from the original on October 22, 2005. Retrieved September 8, 2012. ^ "The Week". National Review. May 23, 2005. p. 10. ^ Friedman, Matti (August 28, 2012). "Court dismisses damages claim in Rachel Corrie case". The Times of Israel. Retrieved July 10, 2014. ^ Kalman, Matthew; Castle, Teresa (July 14, 2004). "S.F. Jewish activist held as security threat in Israel". San Francisco Chronicle. Retrieved August 30, 2014. ^ Jones, Yuritzi (May 4, 2004). "Activist's parents pay tribute". Archived from the original on June 22, 2007. Retrieved December 12, 2008. ^ a b Guttman, Nathan (April 30, 2003). "'It's a terrible thing, living with the knowledge that you crushed our daughter'". Haaretz. Retrieved December 12, 2008. ^ Teeple, Jim (January 4, 2006). "Palestinian Gunmen Attempt Gaza-Egypt Border Break". Archived from the original on December 15, 2008. ^ a b "Memorial to US activist in West Bank". USA Today. Associated Press. March 20, 2008. Retrieved December 12, 2008. ^ France, Louise (March 2, 2008). "How did Rachel Corrie become a Palestinian martyr?". The Observer. London. Retrieved December 16, 2008. ^ Gross, Tom (October 22, 2005). "Dead Jews Aren't News". The Spectator. Retrieved July 12, 2014. ^ "Nonviolent protest in W Ramallah: Parents of Rachel Corrie speak, 17 injured, including journalists". Palestine News Network. March 28, 2008. Archived from the original on July 18, 2011. Retrieved January 19, 2009. ^ Richman, Josh (June 9, 2005). "Dead activist's parents to visit Oakland". Oakland Tribune. ^ Stratton-Coulter, Danielle (June 28, 2005). "Carrying on the fight" (PDF). The Daily Iowan. pp. 1, 7. Retrieved May 12, 2012. ^ "Rachel's Parents Visited the Mavi Marmara". March 28, 2008. Archived from the original on April 30, 2011. ^ "Text of opinion by United States Court of Appeals for the Ninth Circuit" (PDF). Archived from the original (PDF) on November 17, 2007. Retrieved 2007-11-17. . September 17, 2007. ^ "Trial begins over death of US activist in Gaza". Ynetnews. Retrieved August 31, 2012. ^ McCarthy, Rory (February 23, 2010). "Rachel Corrie's family bring civil suit over human shield's death in Gaza". The Guardian. Retrieved July 6, 2014. ^ Sherwood, Harriet (October 21, 2010). "Rachel Corrie case: Israeli soldier in bulldozer 'did not see her'". The Guardian. Archived from the original on October 9, 2017. ^ Sanders, Edmund (October 21, 2010). "Bulldozer driver testifies in Israeli trial over Rachel Corrie's death". Los Angeles Times. Retrieved July 6, 2014. ^ Ben Gedalyahu, Tzvi (August 28, 2012). "Court Finds Corrie at Fault for Her Death, Exonerates IDF". Arutz Sheva. Retrieved September 9, 2012. ^ Eldar, Akiva (February 23, 2010). "Israel grants visas to witnesses in suit over Rachel Corrie death". Haaretz. Retrieved August 28, 2012. ^ Pleitgen, Frederik. "Israeli court: American protester Rachel Corrie's death an accident". CNN. Retrieved August 28, 2012. ^ a b Ackerman, Gwen (August 28, 2012). "Israel Court Says U.S. Activist Corrie's Death Was Accident". Bloomberg. Retrieved July 6, 2014. ^ State Prosecutor's Office, Tel Aviv District (August 28, 2012). "Statement regarding civil suit in the matter of Rachel Corrie" (Press release). Israel Ministry of Foreign Affairs. Retrieved October 25, 2017. ^ "The Guardian's Rachel Corrie obsession". CiF Watch. August 29, 2012. Retrieved July 6, 2014. ^ Sabel, Robbie (August 31, 2012). "ISM was using activists as terrorists' human shields". Jewish Chronicle. ^ Bob, Yonah Jeremy (August 28, 2012). "Haifa court rules against Rachel Corrie family in suit". The Jerusalem Post. Retrieved August 28, 2012. ^ Raved, Ahiya (August 28, 2012). "Court rejects Corrie family civil suit". Ynetnews. Reuters. Retrieved August 28, 2012. ^ Musleh, Maath (August 29, 2012). "On the receiving end of Israeli 'impunity'". Al Jazeera. Retrieved July 6, 2014. ^ "Israel rules activist's death 'an accident'". Al Jazeera. August 28, 2012. Retrieved July 6, 2014. ^ "UN human rights expert speaks out on Israeli ruling on Rachel Corrie verdict". The United Nations. August 30, 2012. Retrieved September 1, 2012. ^ "Jimmy Carter calls Rachel Corrie case ruling 'unacceptable'". The Jewish Journal of Greater Los Angeles. August 30, 2012. Retrieved September 1, 2012. ^ Bob, Yonah Jeremy (21 May 2014). "Supreme Court hears culmination of lawsuit over death of Gaza protester Rachel Corrie". Jerusalem Post. Retrieved 26 January 2015. ^ Lynfield, Ben (19 May 2014). "Rachel Corrie death: Activist's family launch final bid to secure 'justice' from Israel over 2003 bulldozer death". The Independent. Retrieved 26 January 2015. ^ Beaumont, Peter (19 May 2014). "Rachel Corrie's family to have case reheard in Israeli supreme court". The Guardian. Retrieved 26 January 2015. ^ Gallagher, Katherine (21 May 2014). "The Israeli Court System on Trial: The Rachel Corrie Appeal". The World Post. Huffington Post. Retrieved 26 January 2015. ^ Schwartz, Michael; Ford, Dana (February 12, 2015). "Israeli Supreme Court rejects appeal in Rachel Corrie case". Archived from the original on February 16, 2015. ^ "Occupation forces open fire on foreign peace activists". As-Safir. Translated from the Arabic by Eric Mueller. March 19, 2003. Retrieved July 12, 2014 – via Action Report. ^ Murray, Gordon (April 3, 2006). "I am Rachel Corrie". Seven Oaks Magazine. Archived from the original on November 18, 2008. Retrieved December 12, 2008. ^ "Tehran street named after American activist". The Independent. Press Association. August 11, 2011. Retrieved August 12, 2011. ^ "Iran names street after Rachel Corrie". The Guardian. August 11, 2011. Retrieved August 13, 2011. ^ Coyne, Amanda (April 22, 2004). "Cover story". The Anchorage Press. [dead link] See search[permanent dead link] for abstract. ^ Bryson, George (April 25, 2004). "Flashpoint Cantata". Anchorage Daily News. Archived from the original on September 20, 2008. Retrieved May 12, 2012. ^ "The Review". Camden New Journal. New Journal Enterprises. October 28, 2005. Retrieved January 7, 2009. ^ Weiss, Philip (April 3, 2006). "Too Hot for New York". The Nation. ISSN 0027-8378. Retrieved May 13, 2012. ^ Davis, Walter A. (March 6, 2006). "The Play's the Thing". Counterpunch. Retrieved September 2, 2012. ^ Simonson, Robert (October 5, 2006). "My Name Is Rachel Corrie Begins New York Debut Off-Broadway Oct. 5". Playbill. Archived from the original on October 24, 2012. Retrieved September 8, 2012. ^ Dave (February 22, 2008). "International productions of the Play". Rachel Corrie Foundation for Peace & Justice. Retrieved September 8, 2012. ^ "Suas Síos". AllMusic Guide. Retrieved 18 October 2017. ^ Woodward, Heather (September 27, 2003). "Film on Rachel Corrie in the works". The Olympian. The Evergreen State College. Retrieved May 12, 2012. ^ "What we can do". rachelcorrie.org. Archived from the original on April 17, 2003. Retrieved September 9, 2012. ^ Nettnin, Sonia. "Film Review Rachel Corrie – An American Conscience". Scoop. Retrieved May 12, 2012. ^ Horton, Matt (July 2005). "'My Name is Rachel Corrie'". Washington Report. pp. 80–83. Retrieved September 8, 2012. ^ Twair, Pat; Twair, Samir (2005). "New Film on Rachel Corrie". Washington Report on Middle East Affairs (May/June): 46–49. ISSN 8755-4917. Retrieved May 12, 2012. ^ O'Hehir, Andrew (May 3, 2009). "Rorschach "Rachel"". Salon. Retrieved May 4, 2009. ^ Houpt, Simon (May 4, 2009). "The 23-year-old activist who became a lightning rod". The Globe and Mail. Archived from the original on May 5, 2009. Retrieved May 4, 2009. ^ Laub, Karin (June 5, 2010). "Israel remains defiant, seizes Gaza-bound aid ship". Associated Press. Archived from the original on June 8, 2010. Retrieved June 5, 2010. ^ Bronner, Ethan (June 5, 2010). "Israeli Military Boards Gaza Aid Ship". The New York Times. Retrieved May 12, 2012. ^ "The unveiling of the gravestone of American martyr in the Tehran cemetery (رونمایی از سنگ قبر شهید آمریکایی در بهشت زهرای تهران)". Mashregh news. Retrieved 18 March 2015. This page is based on the Wikipedia article Rachel Corrie; it is used under the Creative Commons Attribution-ShareAlike 3.0 Unported License (CC-BY-SA). You may redistribute it, verbatim or modified, providing that you comply with the terms of the CC-BY-SA.